NZXT has release the Sentry LXE, a fan control and monitoring system like nothing else we have seen on the market today. The Sentry LXE is a five fan and temperature probe system which actively monitors your PC (where the temperature sensors are placed and with a five fan controls, the Sentry LXE will automatically adjust fan speeds in order to bring your system the specified temperature you set on the touch screen. • Sleek Design – Brushed aluminum frame provides sleek aesthetics for any desktop. • Rechargeable Battery – The Sentry LXE features a rechargeable battery for up to 500 times, keeping the LXE life time longer without the hassle of replacing batteries constantly. • Using a NZXT developed PCI board and external touch display, the LXE allows for more 5.25″ bays freed up for other peripherals.environment. Simply set the fan controller atop your PC or desktop and connect through PCI card interface. 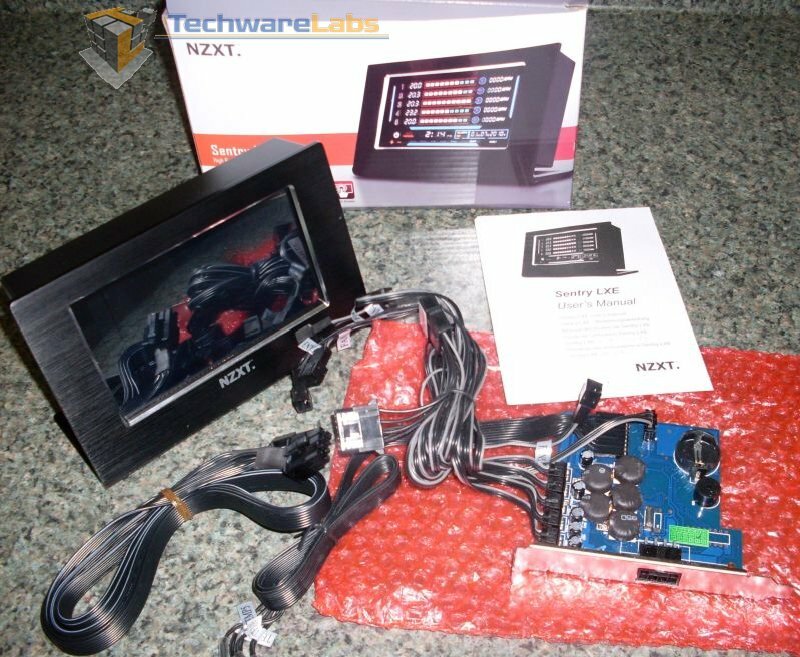 Its actually very very nicely done,the LCD is quality, the colors are good, and it is very handy to overclockers to know what is going on inside your system. You probably don’t like it because you are not an enthusiast, modder, or power user. As for software doing the same thing, this is not exactly true. Software takes up resources, runs extra stuff in the background, and will not physically control aspects of the system like this will. Plus this looks about 100X better. If you want your comments to be taken seriously, try not prefacing them with words like “crap”. It just makes you look uneducated or like you are working for a competitor. this product looks like cheap crap. who wants to sacrifice cable management for another power drawing peripheral, software does the same thing, works great and doesn’t pose a fire risk. The display frame is made of metal with a brushed black finish. The single cable which runs from the display to the card is covered with a rugged braided mesh which is pretty rugged. The individual cables that to the fans and temperture sensors are very tiny and though cable management may be an inital headache, they will not cause a fire at any level. Also the power consumption is very little for the LED display and the rest of the power consumed is to power the fans which were being powered by your power supply prior to the Sentry LXE being installed. Since you appear to be very negative against it, I’d suggest seeing it in person at a local computer store before you label it crap.